While anything with Nicki Minaj in it oozes personality, her app, Nicki Minaj: The Empire, really doesn’t differ too much from Glu’s other games, except in one major way. This one allows you to write lyrics, share them, and also record your own raps. The result is just as fun as it sounds. For her part, Nicki has been sharing the lyrics she likes on her Twitter account, serious or not, and has said she’ll reward high scorers with tour tickets. 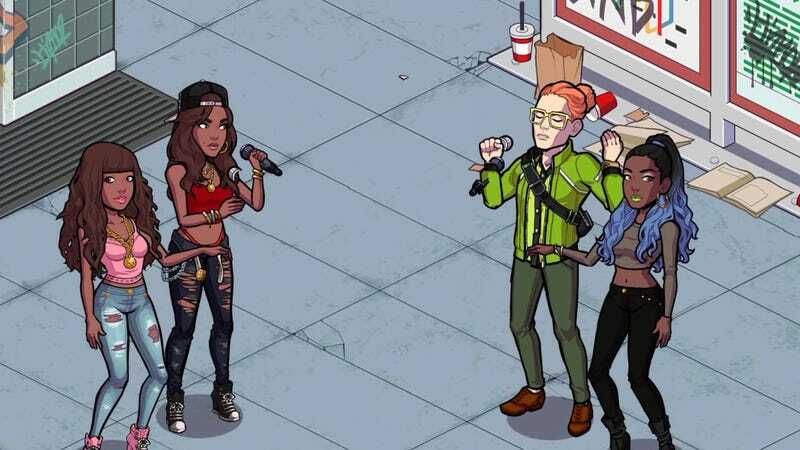 It’s a blurring of IRL and URL that Glu first introduced with an event for Kim Kardashian: Hollywood, where your actions in game would help the real life Kim Kardashian plan North West’s birthday party. The whole point of these apps is to feel close to your favorite celebrities, so what other way to demonstrate that than giving fans exclusive access? To that end, I submit the only user I think is deserving of free tickets: Andrew. This is nothing short of a masterpiece. I hope Nicki makes good on her promises because Andrew really deserves this. I listened to this song before lunch and was overcome with such a powerful hunger. Where is this food truck, Andrew? Where can I also eat pulled pork mac n cheese? I mean, the catered mediterranean we had in the Gizmodo offices today was fine, but now I dream of extra onions and barbecue sauce. Nicki, I demand justice for Andrew. Make like your Glu counterpart and raise him up to superstardom for absolutely no reason. He’s earned it.